Tait Brimacombe, Research Fellow at the Institute, writes about a recent personal trip to post-cyclone Vanuatu. We are now one month on from Tropical Cyclone Pam, a category five cyclone that struck the Pacific Island nation of Vanuatu, bringing with it wind speeds of up to 250 kilometres per hour. Cyclone Pam left widespread destruction in her wake and a unique set of challenges for the delivery of development assistance. I travelled to Port Vila over the Easter break, the two year anniversary of my PhD fieldwork in Vanuatu, and was greeted by a transformed geographical and development landscape. On the evening of 13 March 2015, Tropical Cyclone Pam struck the island of Efate, home to the nation’s capital Port Vila, having carved a path over parts of the Northern islands, and continued towards the Southern province of Tafea. Despite a relatively low death toll (official estimates remain at 11), the UN Office for the Coordination of Humanitarian Affairs estimates that up to 166,000 people have been affected across 22 islands, with up to 75,000 people in need of emergency shelter and 110,000 people in need of drinking water. As an immediate response to the crisis, the Vanuatu Government declared a state of emergency, and the National Disaster Management Office (NDMO) began an assessment to document damage to dwellings and infrastructure, and to ascertain health, water and food needs across the country. It was estimated that up to 90% of structures on Efate were damaged or destroyed by the cyclone, requiring the establishment evacuation centres for families whose houses had suffered damage. However, as time passed, the relief effort shifted. 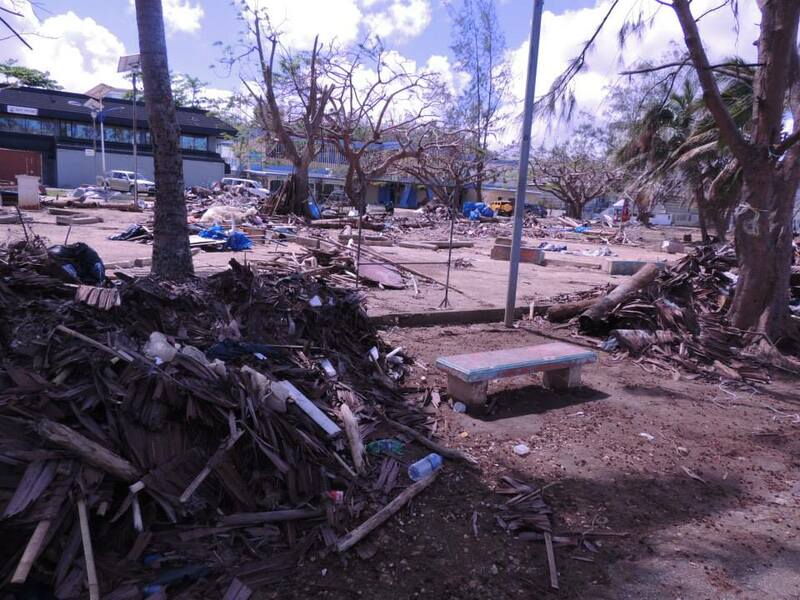 Less than one week after the cyclone, the Vanuatu Government issued orders that all people sheltering at evacuation centres be provided with tarpaulins to enable the construction of temporary shelters, and be asked to return home. Donations from around the world, both financial and goods, began streaming into Vanuatu, with a plethora of crowdfunding campaigns gaining traction on social media. As the number of relief agencies and organisations operating in the country grew, the need to ensure harmonised and coordinated assistance became clear; with tensions growing between the NDMO (the coordinating body) and other organisations, with criticism at the seemingly slow pace at which aid was being distributed. Image: Remnants of the Mama’s Market, Port Vila. One month on from the cyclone, food and water security is an ongoing concern. Vanuatu’s historically fertile soil has been rendered barren by Cyclone Pam, with staple root crops rotting in the rain-soaked soil, and fruit tress uprooted by the strong winds. Unaccustomed to shortages of fresh fruit and vegetables, large proportions of Vanuatu’s population are reliant on government-distributed rations of rice and tinned fish and meat as their staple diet. Tensions are high and speculation rife, with frequent allegations of corruption and unfair distribution of water and food stocks throughout Port Vila. Having received information that households are entitled to one 2.5kg bag of rice per person to be replenished after a 15 day period, families are confused when they receive 7kg of rice to feed 25 people, or alternatively when no further distribution occurs after 15 days. Rumours particular communities or families are receiving food at the expense of others surface daily, with the potential to ignite conflict an ever-present threat. While some families have been able to partially repair their houses, many are not weatherproof and in some instances small family dwellings are playing host to extended family and neighbours whose houses suffered more substantial damage. I spoke to some households who had up to 45 extended family members sheltering in their small two-room dwelling. As well as concerns over public health and sanitation, there are also concerns over the lingering emotional effects of the cyclone, particularly on children; many of whom had to flee their houses in the midst of gale force winds and heavy rain and flooding. A number of mothers expressed concern about this ‘aftershock’ and the ongoing emotional effects on their children. In addition to the damage caused to communities, Cyclone Pam also inflicted widespread damage on Vanuatu’s tourism industry. 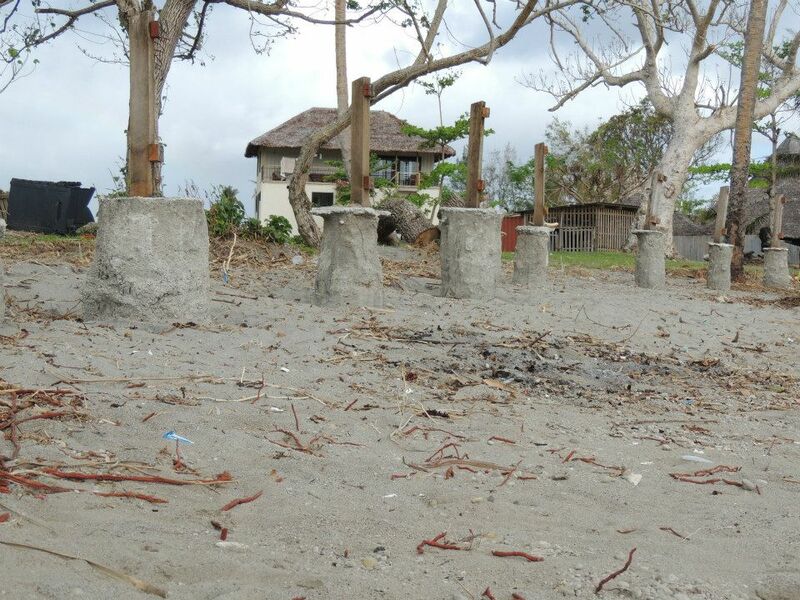 Vanuatu’s hotels, like most other structures, suffered damage, with many forced to remain closed until later in the year while they undertake renovations and upgrades. This has caused a great deal of concern, with many ni-Vanuatu reliant on tourism-related employment are now without work. Despite attempts to encourage tourists to return to the country (including the government-launched #VanuatuStillSmiles), international travel warnings remain in place while a state of emergency remains in place, with tourists on cruise ships left to marvel at the landscape from the harbour, unable to disembark until further notice.